Support: first, prepare yourself with some basic information, then find a retailer you can trust. You need someone who listens and answers the questions you ask, and doesn't give you prepared speeches or product pitches. A good retailer, or an experienced hobbyist friend if you are very lucky, can make all the difference. fish from rapids, of course). Bigger isnšt better. You can also run undergravels on air pumps, but choose a quiet model as a buzzing pump can drive you crazy. Hang on the back power filters are great little machines. Canister filters are superbly efficient, but they are harder to clean, compared to the other types, and that can be an incentive to laziness. If you are buying second-hand filters, look to see they are clean, and that none of the parts appear to be deeply scratched or scoured. If there is a magnetic impeller (in a power filter) pull the magnet out and make sure its surface is smooth, and that it isnšt worn out. You will probably want to replace the filter media anyway, so its condition is not very important. Old-fashioned air pump operated plastic box filters and sponge filters are still a good option, although maintaining them is more work. Sponge filters are very good. Your tank will need a cover. You can make one from glass, but plastic hoods are easier to use and better looking, once you put a light in. If you want plants, buy a hood that can hold more than one fluorescent bulb. Single bulb units are good for fish-only or low-light plant set-ups. Be certain the off/on switch will work on a timer. Some cheaper units must be turned on manually. Even if you are super organized in your daily life, and remember to turn the lights off and on according to a schedule, what happens when you go on vacation? Never buy a cheap heater. A ten dollar heater will probably kill a hundred dollaršs worth of fish. Electronic or high end heaters are best. Look for a durable glass tube (flimsy tubes can crack, releasing electricity into the tank - a dangerous combination). The heater should be approved by the electrical standards association of your country. Submersibles are generally better. Clip-on the back heaters can fall in, with serious consequences. Good heater are expensive, but they are more durable and safer. This is an often overlooked piece of equipment - cheap but essential if you are using a heater. Thermometers that go into the water are more accurate than those which stick on the outside of the tank glass. Talk to your retailer about the wide range of bulbs available for your tank. Fluorescents will lose intensity after eight months. We can't see it, but your plants will know. Water changing equipment: you can purchase water changing systems, run by the tap, that siphon water from your tank, and then allow you to reverse the flow and refill your tank using a hose. They are invaluable if you don't like carrying buckets. Most feature a gravel vacuum at the end of the hose. Remember, if you leave them unattended and running as you refill, your neighbor downstairs had better need a shower. What's the use of a pretty tank if you can't see into it? You will need something to clean algae off your glass, every time you change the water (if it never builds up, it's easy to remove). Beware of scrapers that can scratch your glass. Sponges or fibrous pads can pick up snail shells or sand grains and do a lot of damage before you notice. Many aquarists swear by magnetic algae cleaners. Check them out at your local retailer. -a spoon you use for frozen food, medication etc. If you have to shut down your set-up for awhile, it should be safe. After you find homes for your fish and plants, drain the tank and rinse the gravel and other decorations. Pack up the equipment carefully, and put it away. The tank should be kept in a cool place, but not where it can freeze. Dry heat may harm the silicone. If the tank is unused for several years, refill it carefully. You may have leaks, but you will probably be pleasantly surprised by the durability of an aquarium's silicone. 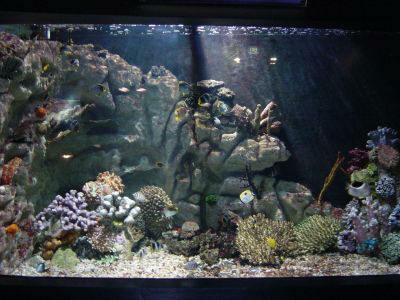 Electrical equipment for the aquarium is subject to the same limits as household appliances. Heaters and lights will have to be replaced, and filters will wear out. Still, the writer of this article has a 26 year old all glass aquarium that has never leaked, and a 23 year old power filter with all its original parts that has never been turned off for longer than a house move. Weak links will be your air pump, as the rubber diaphragms have to be replaced periodically (an easy job). A thermometer will tell you if your heater malfunctions, and you canšt miss a light giving out. instructions. Choose your silicone carefully, as many brands include fungicides or other toxic substances. If it is safe for aquarium use, that will be written on the tube. On rare lucky occasions, leaks seal themselves by their own suction pulling sand into the hole. Cracks in glass are accidents waiting to happen, very quickly. Patches are possible, but floods are much more likely. Seek advice or replace the tank. Never use glues in the aquarium.